Down & Dirty: I am not in Lake Tahoe. I was supposed to be in Lake Tahoe this weekend with Cayce. We had reservations up the wazoo: x-country ski lessons, deep tissue massage, snow shoeing, facials, salt scrubs with shea butter treatments. Instead, a little snow (didn't even qualify for blizzard status in NYC) caused American Airlines to cancel my flight. 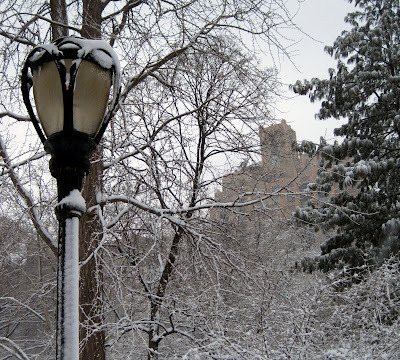 I tried to be understanding, and even managed a few moments of enjoyment as I walked through Central Park. But I wondered why my flight had been cancelled SO far in advance and I'm still not convinced it had anything to do with the storm in NYC. Call me paranoid. Or perhaps I've just been abused by the airlines one too many times. So instead of posts on beautiful Lake Tahoe, here's the next in my series on Santa Fe eateries. On Saturday, we tried two restaurants (at opposite ends of the price spectrum) suggested by friend Rita. The first was El Comal (3571 Cerrillos Rd., Santa Fe, NM, 505-471-3224), an almost invisible diner type place out on Cerrillos. Rita said it was pretty much locals only, which immediately made us want to go. 1) I've eaten a lot of green chile in my days. 2) I've eaten a lot of sopapillas, too. 3) I ate this green chile burrito with shredded chicken faster than I remember ever eating anything. It wasn't just that I was hungry...it was so delicious I couldn't stop. I WANTED to slow down BUT I COULDN'T! 4) Sopapillas are often an extra little something on the table in case you're still hungry when the real meal is over. Not this time. I enjoyed every bite of the fluffy fry-bread, drizzled with honey. If you want a fancy place, don't go to El Comal. It's formica tables, vinyl chairs, friendly service, hungry locals, and excellent food. I started with the arugula, goat cheese, and fig salad and a glass of Prosecco. Superb. Michael's calamari were so lightly fried I didn't even feel guilty eating them and the spicy lime dipping sauce was a zippy accompaniment. He chose veal osso bucco with red chile polenta as his entree and it was terrific. Sadly, I was so engrossed in my own dinner that I forgot to photograph his. My entree was heart-stoppingly delicious: elk steak, medium rare in a red wine reduction with sweet potato puree. I'd never eaten elk before, and being an adventurous carnivore I was tempted by the novelty. Tender, lean, deeply flavorful but not crazy, over-the-top rich, and hey, this is elk country! A glass of Pinot Noir was my beverage of choice. For dessert I did something quite uncharacteristic: I bypassed the chocolate. (Who are you and what have you done with my wife?) Michael and I shared a Pineapple Hazelnut Napoléon with White Chocolate Mousse & Hot Fudge Sauce. Oh my god Oh my god Oh my god. Because the elk was a special, you can't be sure to find it on the menu. But if it's offered I highly recommend it. In fact, if you eat exactly what I ate you should be very very happy and not so full that you want to lie down and die. (!) It was a splurge money-wise, and worth every $$$. Sorry to hear about the Tahoe cancellation, but enjoying reliving your Santa Fe trip vicariously. Never had elk, but from your description if I ever have the chance to try it, I will! You're killing me with all this amazing food I have no hope of access to here! But it stirs my desires to change that. As it pours buckets of powdery snow and school is canceled, I will root thought the larder in search of southwestern ingredients. dude! so sorry about the trip cancellation. big drag. but dreaming/writing about food, a good consolation. ps: my word verification is "carbo", as in..don't eat too many carbos! I am so glad that you enjoyed both El Comal and Ristra! Two of my all time favorite Santa Fe restaurants. Hope to see you and Michael again soon - perhaps in Pennsylvania? Oh, and also, sorry to hear about the Tahoe cancellation. You need to try again - it doesn't disappoint either! Thank you all for your empathy. Molly, I sat. "Eat the carbos, love the carbos." And Rita, thanks again for steering us so right. Please come to PA so we an reciprocate!